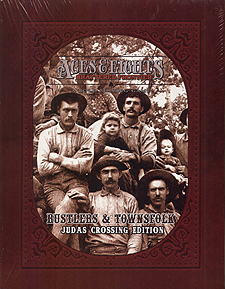 This edition of Rustlers & Townsfolk is packed with over 100 of the most significant non-player characters featured in the Judas Crossing town setting. Of the 400+ individuals listed in the town census, these are the most likely to engage in non-trivial interactions with players and to feature as recurring characters. Having NPCs in this format simplifies play because it allows you easily manage a few key individuals central to the specific scenario you are planning for the evening's gaming session. These record sheets are also a handy place to record notes for future reference. The most obvious use is to record injuries - especially those that will take a significant time to heal and thus may weaken the NPC in some future encounter. You needn't stop there though. The results of any interaction with the players may be recorded on the NPC's sheet - in effect building a case history unique to your individual game. Months later you can act on secret grudges or reward players for past kindness. You can also deploy these characters more broadly throughout your Aces & Eights game. If introducing Judas Crossing into an existing campaign, you may wish to have certain NPCs visit Muskeegie, Lazarus or any other location your players frequent. Interacting with these NPCs can serve as an introduction to the setting. Although an excellent companion product for Judas Crossing, its use is not tied solely to that setting. Much as with the first edition of Rustlers & Townsfolk, these fully fleshed out NPCs have backgrounds, agendas and their own reasons for being on the Frontier. They can fill virtually any role from vicious outlaw to prospector, lawman to card shark meaning that your frontier world is ready to be populated in minutes. This leaves you the time to develop the broad brushstrokes of events to challenge your players without the tedium of having to stat out dozens of primary and tertiary antagonists, allies and passerbys.